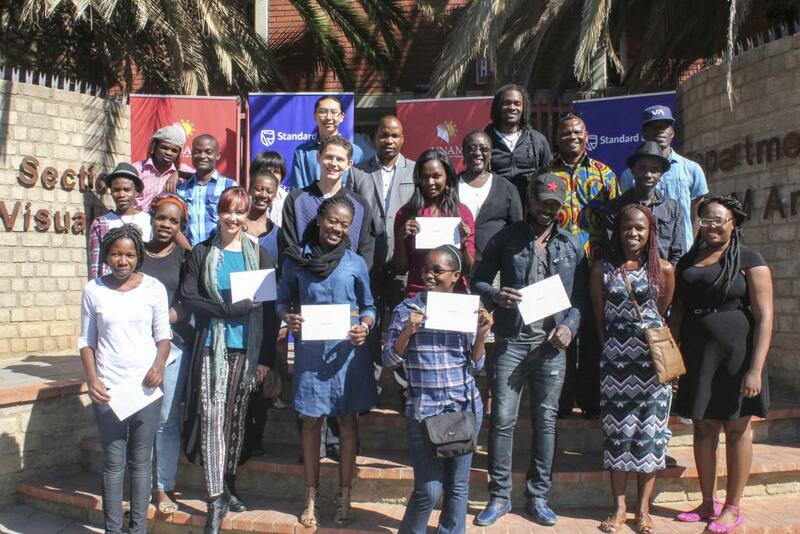 Twenty-six University of Namibia Art students became proud beneficiaries of Standard Bank Namibia bursaries to the tune of N$120 000 for the 2015 academic year. The latest sponsorship is part of Standard Bank Namibia’s annual corporate social investment to the University of Namibia’s Visual and Performing Arts Department. The bursaries cater for a wide spectrum of well deserving art students in the fields of music, drama, textiles, photography and visual arts, primarily for material and research purposes. “Standard Bank Namibia is so proud to be associated to programmes that are aimed at empowering young people who want to pursue careers in the arts sector. Education is one of our top CSI priorities because we believe that education is the catalyst for skills development in our country,” says Standard Bank Namibia’s PR and Communications Manager, Surihe Gaomas-Guchu. This is the 12th consecutive year that UNAM Art students are benefiting from Standard Bank’s bursary scheme which has turned out to bear fruit for the students to excel in their artistic careers, even beyond their academic studies. In response, Head of UNAM’s Visual Arts Department Dr Francois Tsoubaloko said the funding has helped in growing the number of art students within the faculty and at the same time creates opportunities for art students to explore their artistic talent. “Through this programme with the assistance of Standard Bank Namibia, we have managed to built up valuable relationships in the arts industry as stakeholders. Some of our students have made careers for themselves, while others got employment at institutions in various capacities,” says Dr Tsoubaloko. As a token of appreciation, 4th year art student, Zinzile Gordon presented her own artwork titled: “The Namibian Sunshine Inspiration” to Standard Bank Namibia. “I really look forward to buying my own material so that I can finish my project and graduate next year,” says Gordon. Second year Visual Art student, Trianus Nakale, adds that it is a struggle for an art student to buy material so the bursary is a helping hand for them. “Art is my passion because everyone in my family are artists, so the bursary will really help me make my artistic dream come to pass,” says Nakale smilingly.